The narrators for this year’s Candlelight Processional have been announced and reservations are now open for the Candlelight Processional Dining Packages at Epcot. 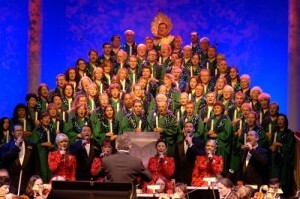 The Candlelight Processional takes place this year from November 27 through December 30. Performances are three times each night. The Candlelight Processional dining packages include a meal at a select Epcot restaurant and guaranteed seating at one of the evening’s performances. The Disney Food Blog has a full list of participating restaurants. Dining packages are available for lunch or dinner. The lunch packages start at $39.99 for adults and $12.99 for kids while dinner packages start at $51.99 for adults and $16.99 for kids. The Garden Grill is offering a breakfast package this year too for $38.99 for adults and $22.99 for kids.